“A novel of love, loss, and honour amidst the horrors of war and its aftermath. I had read this book last year, and really enjoyed it…especially the Canadian history factor! This time, at the invitation of the author, Genevieve Graham, I listened to the audiobook version! And I enjoyed this story again! The narrator, Fajer Al-Kaisi, has a pleasant-sounding voice that’s easy to listen to. I appreciated Audrey’s bravery in leaving her grandmother’s farm to go to Canada. She thinks through this decision, weighs the pros and cons. Basically it’s not a spur of the moment decision; she realizes that there was nothing for her in London or on her Grandmother’s farm. She recognized that she and Danny had a unique connection after a mere 24 hours together and countless letters written back and forth between them. So she makes the brave decision to leave her unhappy life and reach forward to seize her own happiness. I found myself being quite invested in these characters. Danny returns to Canada from the war as an amputee after having lost his leg. When he loses his leg, I briefly felt completely as if Danny was actually someone I knew. I love it when an author can make a character SO real like that! Upon Danny’s return, he’s having to deal with his new life with a missing leg, plus his own battle in dealing with what he experienced in the war. When Danny’s father asks him “How’s your heart and mind?” that question just seemed so sensitive and is probably a great question to ask to begin a conversation around dealing with mental health and/or PTSD. 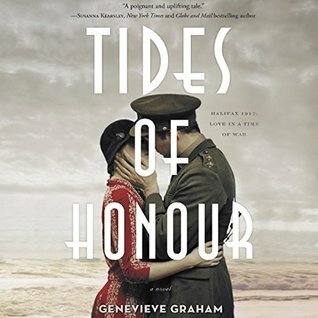 Thank you to author Genevieve Graham for this opportunity to review this audiobook and to share with all of you a few of my thoughts about it. If you’re a fan of Canadian history I’d encourage you to read this book…or listen to the audiobook version (that still counts as reading!). And, if you enjoyed this story and it’s characters, please check out another book within this “family” which revolves mostly around Danny and Audrey’s children. It’s entitled Come From Away. *My Progress for the Canadian Book Challenge is 4/13!! < Previous Harry Potter cover art: mystery solved!